My PhD research explores design activism in the context of my practice as a designer-maker of knitwear. Motivated by the prospect of a more sustainable and satisfying fashion system, I am investigating the idea of “openness” within my practice. Openness can be explored on a number of levels. At a macro level, I have constructed a metaphor of fashion as a commons, which has been subject to gradual enclosure through professionalization. I see a lack of making knowledge as one element of this enclosure, and suggest that an open fashion system would permit a greater role for individuals to make and maintain their own clothing. However, I am aware that the majority of knitters focus on making new items—mirroring, rather than challenging, the linear production-consumption model of the mainstream fashion industry. Design researchers Alison Gill and Abby Mellick Lopes argue that too many sustainable design initiatives involve the production of new things; they suggest that “the challenge for the material practices of design might be recast in terms of a negotiation with those things already in existence.” 1 I concur, and argue that the same is true for amateur making. I have chosen to initiate re-knitting as a new “craft of use” 2 and to study how it develops. 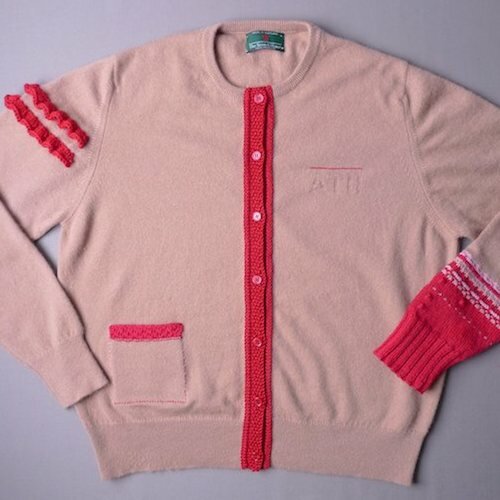 By “re-knitting,” I am referring to a range of processes that utilize knitting skills, techniques, and knowledge and can be carried out by individuals to repair and alter existing items of knitwear. 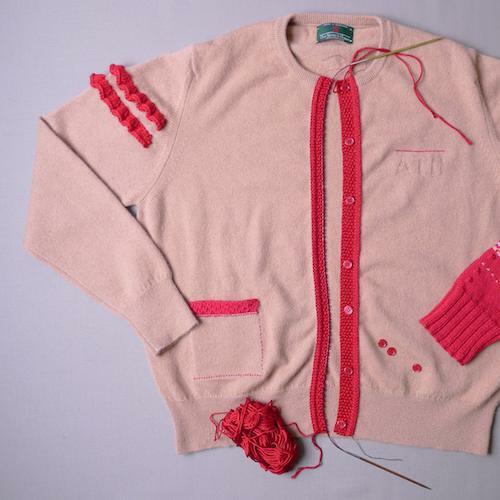 Re-knitting extends the making relationship beyond original contstruction, and has the potential to keep garments in use longer. 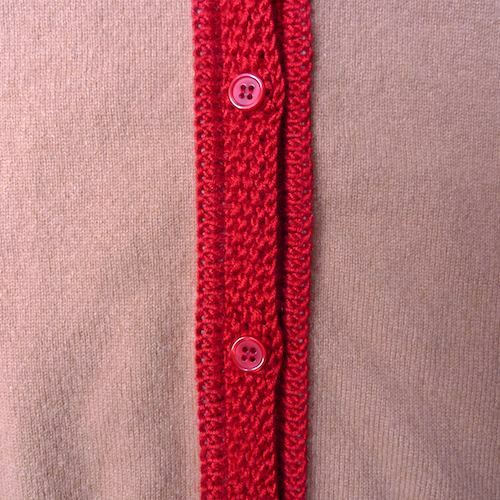 Activity in this area has been patchy; while there are many examples of wearers repairing and reworking garments using dressmaking techniques, current examples usingknitting are limited. Although it was common to rework knitted garments in the past, such practices have fallen out of favor. The ability to open and reconfigure a garment depends on its physical properties, and what one perceives to be possible. 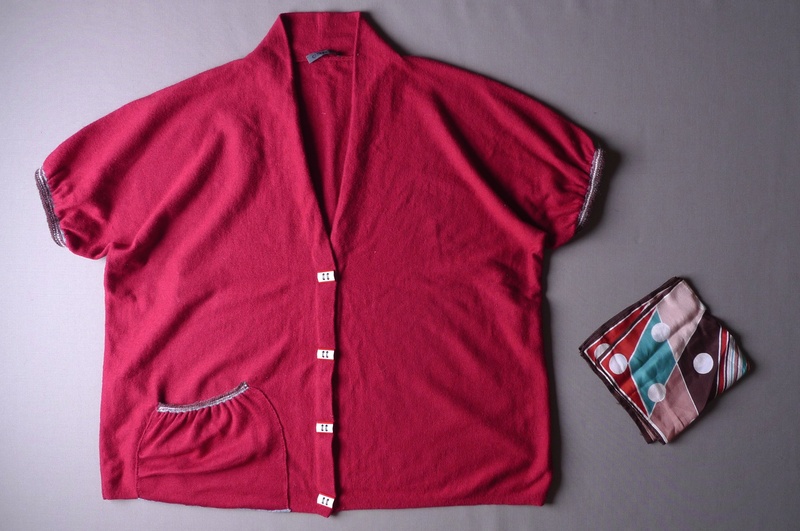 Although knitting has an inherently open and “tinkerable” structure, we tend to perceive garments as closed and inviolable. Activity is limited by a lack of knowledge of how to open and alter the fabric and by cultural expectations regarding “appropriate” ways of interacting with our clothing. 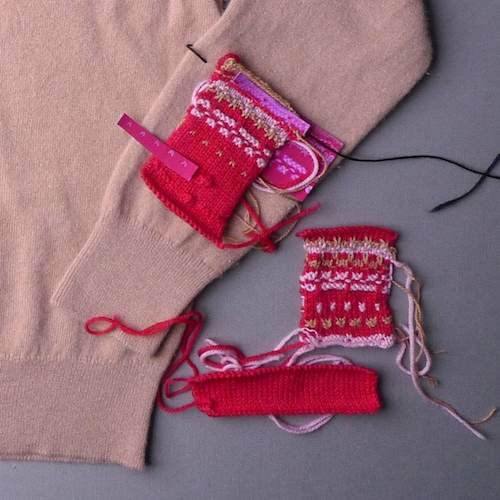 As part of my research, I worked with a small group of female amateur knitters, exploring ways to open existing knitwear and discussing the emotions involved; through this article, I would like to share their experiences, and their words. At the start of the project, I asked the knitters about their perceptions of altering knitwear. My experience of altering things, or dressing them up, is limited but … they always involved changing the buttons or putting lace on it or something like that. And it just never looked right. It was never good enough that you’d want to wear it. It was a lot of effort, and the result was unsatisfactory. I can’t see it, I can’t visualise, I can’t imagine what you would do. I’m not very imaginative in that way. I wouldn’t like to spoil something that’s perfect. Despite these concerns, they liked the idea of re-knitting and could think of items that they might want to change. This is an article … perhaps I can do something with it, so that I can wear it, and it be an interesting, individual piece. Certainly, it’s not at the moment. 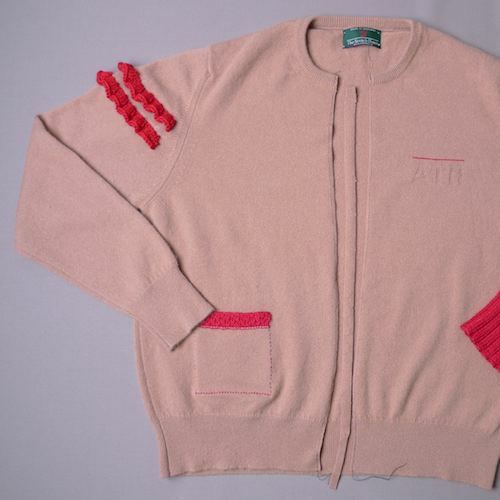 Before starting to work with the group, I developed a range of methods for altering knitted garments. 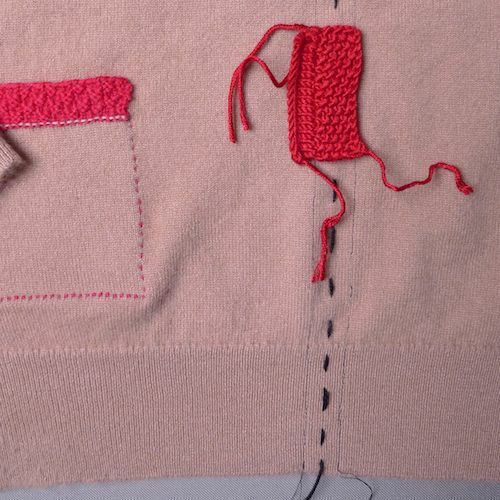 Many of the methods involve opening the fabric through unraveling, laddering, or cutting; knitters have different experiences of, and feelings about, each of these actions. 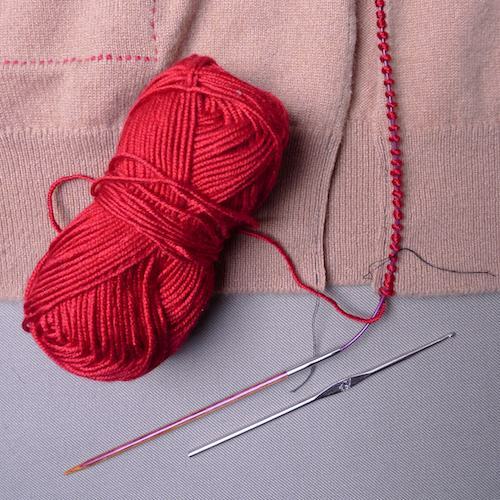 Unraveling—the deconstruction of the fabric, row by row—is a common activity within conventional knitting. Unraveling directly reverses the formation of loops involved in knitting, and the yarn remains in its original state, as a continuous strand. 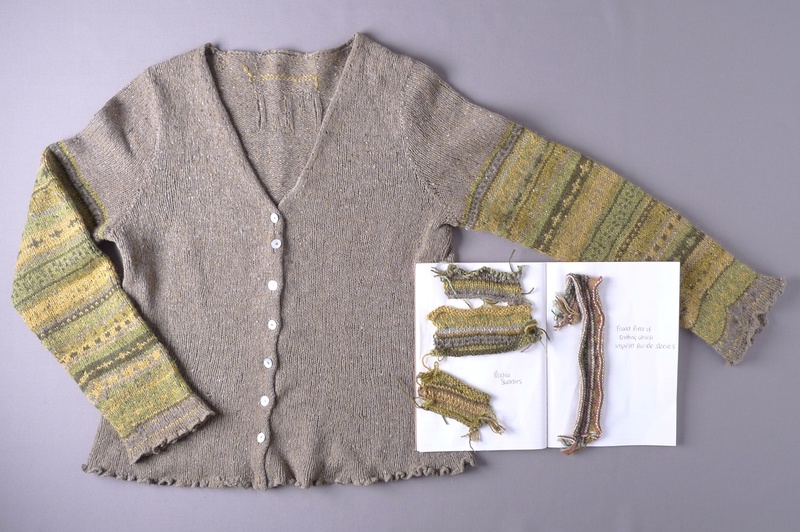 Knitters unravel and re-knit their work in order to correct mistakes; this might be a small section of a single panel, or an entire garment that has not “turned out.” Some knitters also unravel existing items of knitwear to reclaim the yarn. When I was first married, and we didn’t have much money, I used to buy jumpers at jumble sales and unpick them, and knit my son jumpers from the best of the wool. Hence, unraveling can be seen as an integral element of knitting practice. Although unraveling is sometimes associated with disappointment, the process offers the satisfying opportunity to start afresh. 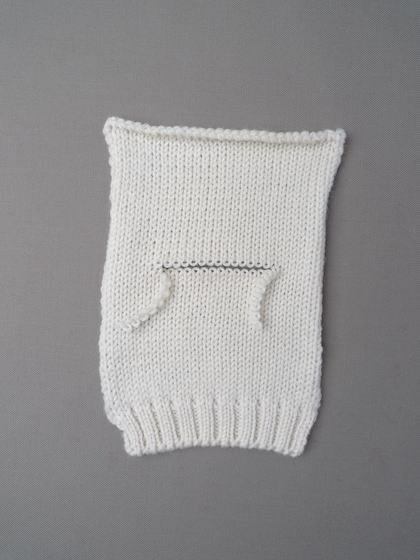 I’ve knitted one thing recently that was appalling, I mean the fit, it was just dreadful, rubbish pattern. And I’ve pulled it out to wool. I’m known as a backwards knitter. I’m always pulling stuff out and doing it again. I can’t bear to be defeated by some balls of wool, and I can’t bear waste. Laddering occurs accidentally when a stitch is dropped; for some, this is a worrying experience. I’m always scared, if you drop a stitch or something, I’m always scared it’s going to run right down to the bottom. However, most knitters know how to re-form a ladder, and are able to use this technique as an alternative means of correcting mistakes. The actions of both unraveling and laddering, therefore, are seen as relatively safe; in contrast, knitters generally have a horror of cutting knitting. If I mention the word cut to knitters, the response is usually a sharp intake of breath and a look of panic; more than once I have heard “sacrilege” muttered in response. Their horror is understandable: when a knitted fabric is cut, the structure of intermeshed loops is disrupted, and it cannot be unraveled into a continuous thread. Cutting cannot be reversed, as unraveling can; therefore, it is a more violent means of opening a fabric. 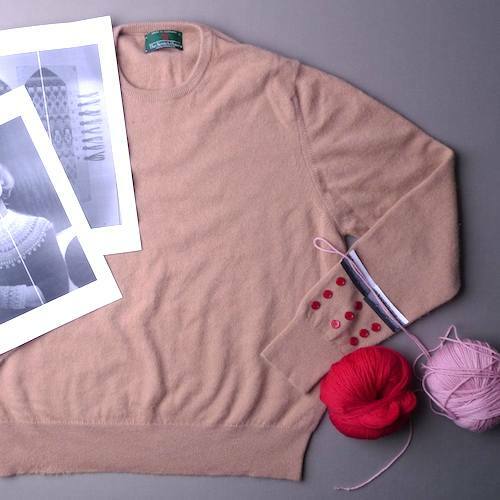 To explore these feelings, we deconstructed some knitted garments together. During this process the participants’ perceptions of the knitted fabric started to change. They realized that the nature of the knitted structure is such that ladders need manipulation to “run,” and a fabric cut vertically does not come apart without vigorous handling. It’s that expectation that it would all fray, and it just hasn’t. It’s liberating because it’s not all just disappeared. There’s something subversive about doing this. 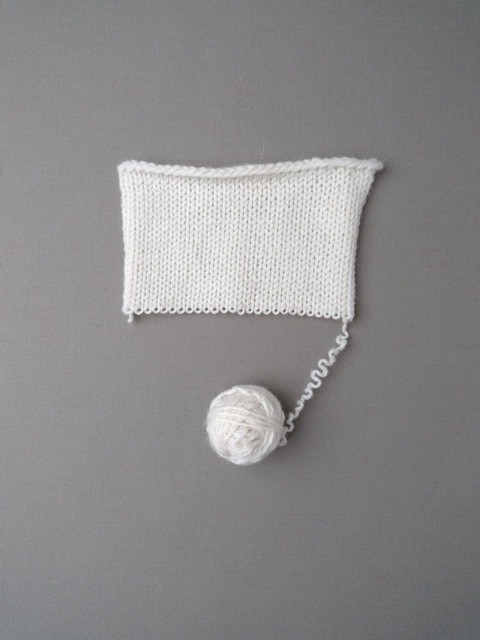 The experience of deconstruction proved to be essential both in developing a deeper understanding of the knitted structure and in building a willingness to open knitted garments. Following the deconstruction activity, we tried out a number of the re-knitting techniques that I had developed; this introduced the participants to a range of options. The project culminated in each participant using re-knitting techniques to alter an item from her own wardrobe; I was able to observe their emotions and thoughts as they negotiated this new experience. The knitters felt it was important that their re-knitting alterations produced an improved outcome; however, this was thought to be a challenge. It’s a very fine line, between altering something and ending up with something naff, and ending up with something where actually you’ve improved on it. I don’t want the cure to be worse than the disease. Yes, as if it’s meant to be like that, rather than sticking it on for the sake of it. 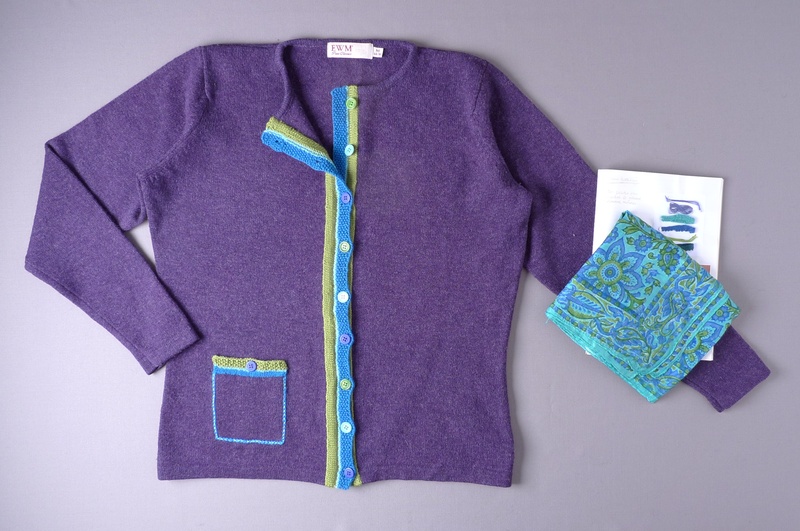 Following the project, the knitters reflected on their transformed garments; they were pleased with them, and considered their alterations to have improved the original items. They also felt positive about the activity of re-knitting. It’s been really quite exciting, what you can do with existing garments that you’ve got. Just to turn them into something really original, which I think is fantastic … it’s quite a liberating thing. You feel like you can go in and alter and put back together. It’s a really nice thing to do. They described feeling proud of having achieved a complex task. I’m impressed with the way it all works, the construction of it. I think that’s really clever. And I’m quite pleased that I’ve been able to do it. We’ve done things I would never have dreamt of. It’s made me a bit braver. It does feel good (“noble” perhaps sounds too pompous) to reinvigorate a rather sad garment. I feel, sort of, justified that I’ve been able to turn it into something I want. And I shall feel self-righteous when I wear it! I was excited to hear that they would continue with this activity in the future. I’ve realised that knitting the garment is not the end of the journey. Whereas before, when you knitted something, you either wore it out, or got tired of it, or gave it to charity. But it’s no longer the end of the journey, it can always become something else. At the end of the project, I asked: What advice would you give to another knitter interested in re-knitting? It doesn’t have to be an immediate success. You’ve got to allow for, not exactly failure, but for things to turn out in a surprising way. Alison Gill and Abby Mellick Lopes, “On Wearing: a Critical Framework for Valuing Design’s Already Made,” Design and Culture 3, no. 3 (2011): 312. Kate Fletcher, “Craft of use,” accessed August 11, 2013, www.craftofuse.org.